Skin products with wheat germ oil are great for soft hair, skin and nails. Healthy foods with vitamins a, d, e, lecithin and proteins are anti-aging for your skin. 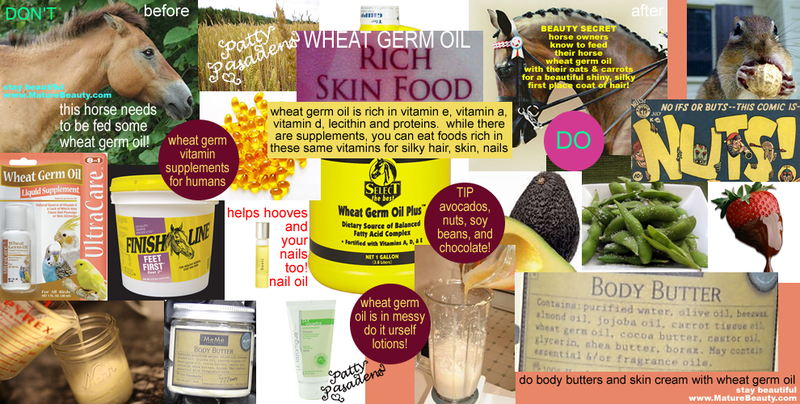 Wheat germ oil secret! Wheat germ oil is un-refined oil that is one of the richest sources of vitamin e, vitamin a, and vitamin d. Wheat germ oil also has a high content of lecithin and proteins. Wheat germ oil is most commonly used for external application to the skin. It helps with skin dryness, skin cracking and skin irritations. Wheat germ oil is making its way into anti wrinkle and anti aging skin care products. The oil is extracted from the germ of the wheat, which is rich in proteins, vitamins and minerals. The oil is also known as the botanical triticum vulgare. Wheatgerm oil is known to have excellent antioxidant properties. The oil is thick, dark, some-what sticky with a syrup consistency and it smells un-fabulous. Typically wheat germ oil is applied to the skin as part of a cream. We know that this oil can be a good skin care ingredient, so long as the oil is combined into a skin care product that smells nicer and is part of a skin cream with a smooth not sticky consistency. Wheat germ oil is often in home-made skin creams, and I’ve seen it in recipes for organic anti-aging face creams. Wheat germ oil, along with shea butter and beeswax are the primary ingredients for home made wrinkle creams and body butters. The beauty secret that women don’t know about wheat germ oil is that wheat germ oil, when taken internally, for instance as a vitamin supplement, can soften skin and hair tremendously. I’ve heard wide ranging claims about its ability to repair skin cells, soften skin, improve athletic performance, aid the immune system, help with healthy cell growth and regeneration, and relieve dematitis. I don’t know that I believe all these claims, but I do know for sure that the ingredients in wheat germ oil are definitely good for the hair, skin and nails. Please see my picture to find the unlikely source of my information and my unscientific proof positive of this beauty secret! Wheat germ oil can be taken orally, most commonly as vitamin supplements. A great idea in theory, but the problem is that I am not a fan of swallowing vitamin supplements for beauty. I personally feel safer getting nutrients from food, and I am too lazy to swallow vitamins on a daily basis. Vitamin supplements with oils such as fish oil or wheat germ oil and even vitamin e oil are gel coated and annoyingly awful to swallow. So I am not necessarily recommending wheat germ vitamin supplements. That being said, a more general extrapolation can be made which is: some surprisingly common foods contain oils and beneficial properties similar to those found in wheat germ oil. When these foods are consumed as part of your regular diet, you can vastly improve the softness and smoothness of your hair, nails and skin from within. I’m serious! If you are not into taking vitamin supplements for beauty, the smart alternative is to know what healthy foods have the properties wheat germ oil has, and eat them as part of your healthy eating diet. Wheat germ oil is rich in vitamin e, so you’ll want to eat foods rich in vitamin e for healthy skin. Such foods include healthy oils such as olive oil, nuts such as hazelnuts, almonds, pine nuts, popcorn, brazil nuts, walnuts, and finally avocado. Eating nuts and avocadoes, quite frankly is the easiest way to get the vitamin e that is going to be good for your hair skin and nails. Linoleic acid, oleic palmatic and stearic fatty acids are the essential fatty acids that are present in wheat germ oil. These essential oils cannot be manufactured by the body so you’ll want to consume foods rich in the healthy, good for you fatty acids to get that sleek supple skin, hair and nails. Linolenic acid is the principal Omega-3 fatty acid. You can get it from foods like walnuts, pumpkin seeds, sesame seeds, avocados, dark leafy green vegetables like kale or spinach, salmon, or tuna. Soybeans (edamame) are rich in oleic acid and lecithin! You can get soybeans at the sushi bar or buy them frozen from Trader Joes. You can get the stearic fatty acids from my favorite food, chocolate! Since wheat germ oil is high in protein, you’ll want to eat whole grains such as wheat germ or quinoa which is a great source of protein, chick peas, tofu, beans and other protein rich vegetarian foods. You can also eat lean meats if you aren’t vegetarian. You’d be surprised what the vitamin e and essential healthy fatty acids can do for making your skin, hair and nails more beautiful. You can take the beauty lesson learned from wheat germ oil and simply consume foods that contain vitamin e and essential oils. For me personally I prefer nuts, avocadoes and soybeans to oils (even if they are the good kind) since oils can give you a greasy stomach ache. It’s easy for me to eat these foods because I’ve always loved avocadoes, I like nuts too, and soybeans (edamame) are what you find as an appetizer at the sushi bar. Chocolate is my favorite guilty indulgence so thank god it’s got a few health properties to justify eating it from time to time. I would stick to the vegan (avocados, nuts, soybeans, chocolate) choices and avoid red meat, unhealthy oils and margarines which just don’t agree with the tummy and aren’t good for your health anyways. You’ll be getting the same vitamins and nutrients that wheat germ contains if you add these foods to your diet. You should notice your skin and hair becoming soft and supple after a few months. As far as external skin creams go, I’d definitely look for body butters and skin creams that contain wheat germ oil as an ingredient. You’d be amazed. Wheat germ oil, shea butter, and similar moisturizing ingredients can be found in good body butter skin creams, nail oil, natural anti wrinkle creams, organic lotions, and even conditioning hair products. These are great for soft skin and products that contain them don’t generally cost much money. Not only will your skin, hair and nails be soft, you’ll save money too. Remember to eat foods that have wheat germ benefits, namely vitamin e, a, d, lecithin and protein, and look for discounted beauty products with wheat germ oil used as an ingredient. Your hair, skin, and nails will love you and so will your cosmetics budget!